In this post I’ll try to tell you where we stand in this both exciting and wonderful world. First of all, I want you to know that we’re not into the closed circuit 4×4 races. It’s not our kind of fun. It doesn’t light our switches. And we’re not into modifying vehicles beyond recognition only to make them capable of achieving the impossible. For us, it’s a journey which starts over the topo map. Every time we have a desire to go beyond, to discover something new, to reach a different secret place where we’ve never been before. And to turn off our engines there, listening to the sparkling stream and the campfire cracking. To us it’s above all a way of life. I’d lie to you if I said that we don’t winch, or don’t do exciting things. Yes we do. But we winch when we get stuck, or when the going without winching gets too dangerous. We don’t get stuck in order to winch. If we have a choice how to reach our goal, we choose the safer option. Sometimes we don’t have that choice, so we accept the challenge. But we never rush and panic, rather we calm down, analize the situation and come up with the best solution. It’s better to walk even a few kilometres on unknown terrain until you get the big picture and make a plan, than to rush into something that you can’t back out from. I’d also lie to you if I said that we think that challenging, rocky, muddy or steep terrain is no fun. It is a very good feeling when you and your dependable rig manage your way over obstacles that amateurs would have thought were impossible to conquer. But we invest an effort to find a fine balance in that. 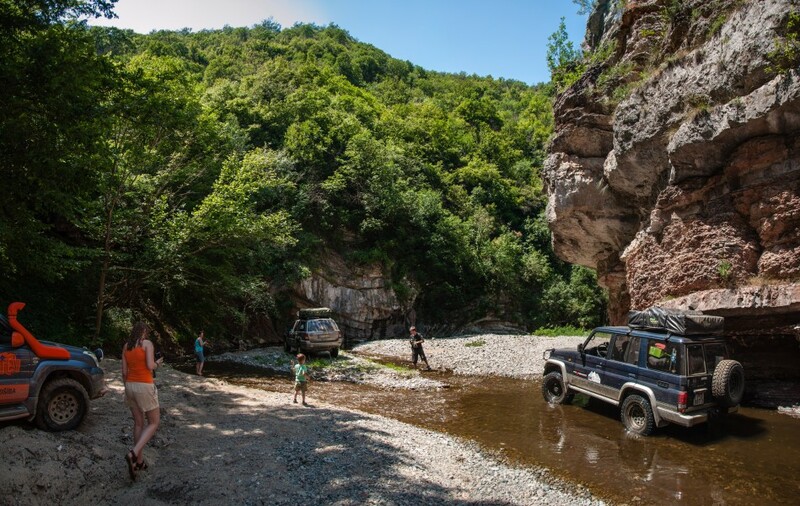 As we drive vehicles that are best suited for long overlanding journeys, we limit the challenges to those that such vehicles realistically and safely can handle without damages. We know that water and deep mud isn’t really a healthy environment for your screws, joints and wiring, so we avoid excessive dipping into it if we have the possibility. But when offroading in the real world, you simply have to cross rivers and muddy trail portions sometimes (and maybe even winch yourself out). Yes, our tours are definitely family friendly. The risk level that we’re ready to take doesn’t require you to wear helmets or construct cages, so you don’t have to worry if it’s safe to take your kids or your pets on a tour. In fact, I think they’d enjoy it very much! We want to show you the sheer beauty of nature, to give you the privilege to be in places that few have been to before, places that we’ve discovered in 40 years of continuous, passionate exploration, both on wheels and on foot. That’s our idea of 4×4 travel. We call it overlanding. If that happens to be your idea too, you’re among friends. So you’re sure you want to come along? Take the next step!